I spent part of my Saturday afternoon in a shop with Mr. Karen, picking out a mat and frame for the Matterhorn poster we bought when were at Disneyland in October. The poster only has a handful of colors: blues, white, and grey with accents of orange, yellow, and brown. I think that helped when it came to narrowing down our choices from the many, many options in the store. 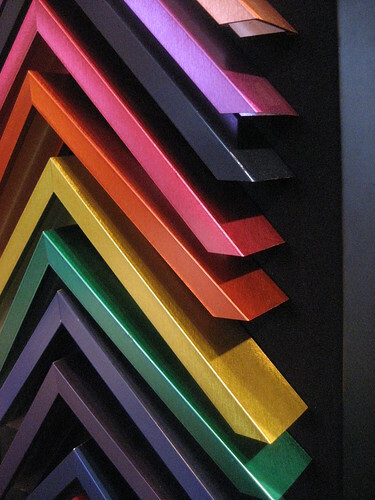 None of these very colorful metal frames made the final cut, though we did try out several of them before deciding they were either the wrong shade or took the focus off the poster. We ended up with a textured white matte that reminded us of snow and a brushed silver frame (which was a late addition to the tryouts when it was pulled by the person who works in the shop once it was our turn with her). Now we get to wait two weeks or so to see if we made the right choices. In ten Januarys writing this journal, this is the first time I’ve posted an entry on the 7th. But this year, Holidailies is still going, so here I am.